Patient loyalty can no longer be relied upon. As with all industries, competition between healthcare providers for market share remains rife, and shaping a large part of the battleground is the rising consumer demand for digital convenience and better experiences. Indeed, in today’s environment, patients are known to routinely switch providers for a better experience – even if that experience is as simple as being able to electronically access their medical records. The problem with the patient experience, as Phillips sees it, is to do with how many healthcare providers view the patient journey. The average patient spends just eight minutes with a doctor – but this is far from but being the entirety of the experience. When viewed from the perspective of the patient, there are many more steps along the patient pathway than just the time spent with the doctor. When looked at the from the perspective of the patient themselves, it becomes readily apparent the eight minutes spent in the actual doctor’s office only accounts for a tiny proportion of the experience. How, then, can the periphery activities be streamlined and made more convenient for the patient? For Philips, this is where mobile technology comes in. When Philips started to view the patient journey as multi-staged process, it quickly became apparent that there were many opportunities where mobile convenience could be introduced to streamline experiences at many different levels. Allowing appointments to be booked via a mobile app, removing a time barrier between finding a doctor and booking an appointment – potentially leading to less “shopping around” amongst patients. Easy linking to Google Maps or Uber to make getting directions or arranging transport effortless. In-app prescription ordering and refills, plus tools to arrange the collection and delivery of medicines. A built-in plan-of-care diary to make it simple for patients to manage their treatment program, including push notifications reminding patients to take their medication, to attend follow-up appointments, etc. Bringing their innovative ideas to reality, Tampa General hospital released TGH GO on both Android and iOS. Offering close to everything they had come up with at the planning stage, and a few more things besides, TGH GO was poised to make accessing the services at Tampa General a whole lot more convenient. Some ideas even went beyond what was initially planned. 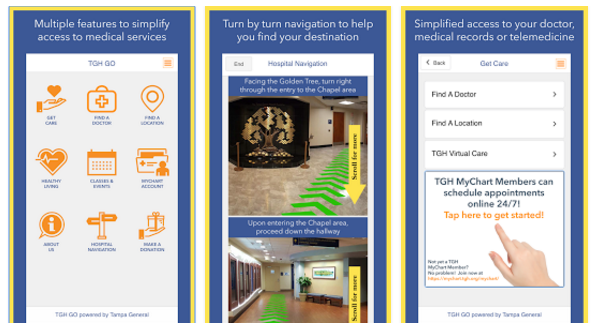 For example, instead of just providing directions to the hospital, TGH GO directs patients right up to the correct department, using internal images of the facility, complete with helpful green arrows to follow. What’s more, Tampa General decided that just digitalizing all the steps apart from the doctor visit itself fell short of offering the complete digital patient experience they were looking for. And so they added the telemedicine Virtual Care feature. 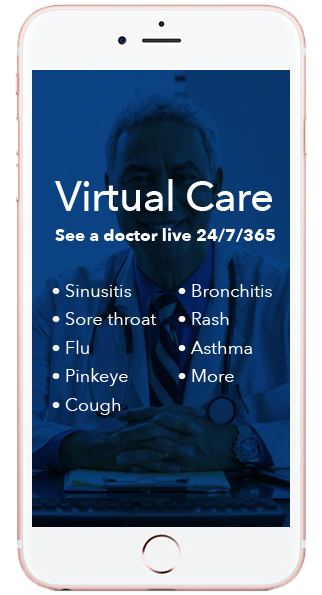 Virtual Care allows both adults and children to access a face-to-face consultation with a real board-certified doctor from their homes or wherever they are via videoconferencing, 24/ 7/365. Waiting times average at six minutes, and most complaints can be resolved within ten. Prescriptions can be sent directly to the patient’s local pharmacy, and credit card payments can be taken via the app. In all, TGH GO has revolutionized the way in which patients interact with Tampa General. By recognizing the lessons that could be learned from the technological advances being made in other consumer-facing industries, Phillips and his team have brought mobile and omnichannel convenience to the entire patient journey. Hear Tampa General’s Chief Experience Officer Rebecca Zuccarelli at Next Generation Patient Experience 2017 this November.